Anton Bishop Bang was the author of numerous books on general and Norwegian church history and had a fine library. In 1914, friends of the College arranged to acquire 5,000 of these books and add them to the Luther College library. The announcement of the acquisition was received on founder's Day in 1913 and prompted steps toward erecting a new library building on campus. This collection was purchased from the estate of Bishop Bang by the Hon. Lauritz S. Swenson, LC 1886, Mr. Herman Haugan, banker from Chicago, and various alumni clubs which donated sums of $150.00 or more each to secure the collection and donate it to the Library. The collection was especially rich in Norwegian literature and history, church history, geography, and topography. Librarian Karl Jacobsen, LC 1902, Mrs. Jacobsen, and Prof. Enoch Peterson. LC 1912, arranged the Bishop Bang collection, classifying part of it and arranging the remainder by classes in a special collection. When the library moved from Koren to Preus Library in 1969, this special collection was dismantled and the books dispersed into the remainder of the library with some volumes transferred to the Rare Book Room and others to the stacks or the DEPO (closed stack) collection. All of the books received as part of the Bishop Bang collection are marked with bookplates stamped with the name "Bang" while the catalog records also record the donation. 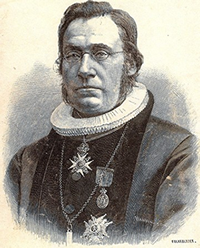 Anton Christian Bang (1840-1913) bishop, church historian, and Doctor of Theology, was the son of farmer and fisherman Ivar Christian Bang (died 1847) and Mariane Klabo. He was born September 18, 1840, in Dønna, also the birthplace of O.E. Rolvaag. He grew up in this farming and fishing community. Like Rolvaag, he went fishing in Lofoten as a young man. In 1860 he graduated from Tromsø teacher training college. He became a theological candidate in 1867. From 1868-1872 he was a chaplain in Gran and in 1874, he became a pastor at a mental hospital in the capital, Christiania (Oslo). His career grew when he was appointed as a professor of theology in Christiania in 1884. In 1893 he became head of the department of church and education, a position he held until October 1895. He became bishop of Christiania from 1896-1912. In 1895, he received the Order of St. Olaf. He died in Christiania, December 29, 1913. In 1868 he married Laura Helene Marie Kaasen, born in Eidsvold, April 10, 1838, daughter of Sheriff Ole Kaasen and Anna D. Bay, who died in 1909.
of Luther's Catechism among numerous other works. As bishop of Christiania, he was a friend of the Swedish royal family who were concurrently the royal family of Norway. This situation placed him in a difficult dilemma in 1905 when the Danish prince was installed as the King of Norway, Haakon VII. While Bang delivered the sermon for the king's coronation, he did not set the crown on the king's head. He published his memoirs in 1909. Translation and notes by Øyvind Gulliksen, Visiting Scholar, and Kari Grønningsaeter, Visiting Faculty Member, Scandinavian Studies, Luther College, 2002, from Norges Portraet-galeri (Christiania: A.M. Hanche, 1906-) and Norsk Biografisk Leksikon (Oslo: Kunnskapsforlaget, 1999). Photo: Brochmann, Johannes, Biskop Dr. A. Chr. Bang. Et Livsbillede (Kristiania, Norway: Alb, Cammermeyers Forlag, 1898).